Sir Bruce Ingram, O.B.E., by 1938; (+) Sotheby's, London, 11 March 1963, lot 37 (500 gns to Goyen). On the Dutch art market, June 1965. M.S. Robinson, The Paintings of the Willem van de Veldes, 1990, I, p. 86, no. 640, where dated to the 1680s. London, P. & D. Colnaghi, Masters of Maritime Art, 1938, p. 29, no. 22. Sir Bruce Ingram (1877-1963) was the distinguished editor of the Illustrated London News, who formed from 1936 a collection of pictures and drawings that at one time consisted of more than 5,000 works. 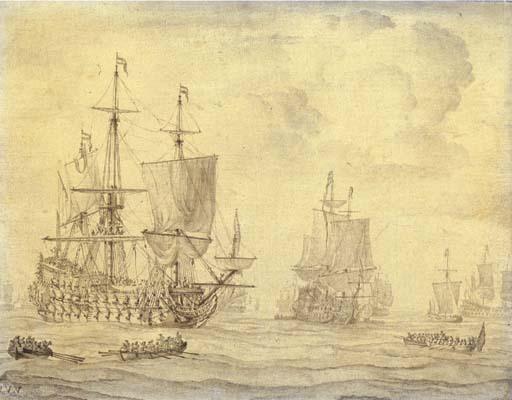 Pre-eminent among the collection were the works of the two Willems van de Velde, 700 of which were presented to the National Maritime Museum, Greenwich to mark his eightieth birthday. Other museums that benefited from his collection were the Fitzwilliam Museum, Cambridge, the Birmingham Art Gallery and the Royal Scottish Museum. Ingram was honorary keeper of drawings at the Fitzwilliam Museum and honorary adviser on pictures and drawings to the National Maritime Museum.